✔ EASY SETUP: Sonic Recognition Technology featuring One Key WiFi Configuration makes setup so quick and easy, .Just plug in the power cable, download the iSmartViewPro App and set it up via your iPhone or Andriod smartphone, remote access to the wireless security camera on iPhone/ iPad/ Android phone/ tablet/ MAC/PC, keep an eye on your loves and belongs anywhere anytime. ✔ MOTION DETECTION: Motion Detection with email or push alert notifications based on motion sensing technology. Motion detection sensibility can be adjusted by yourself, When the camera detected abnormity or alarm is triggered, instant alarm pictures will be sent via email/FTP. ✔ EASY INSTALLATION: You can put the Mini Security Camera on desk and adjust the viewing angle to your needs or take the plastic part off and put it on the wall with the included screws. Install the home security camera in baby room, office, kitchen, living room. You can monitor every corner of your house. ✔ ONE WAY AUDIO AND DAY VISION: The Mini IP Camera is built in Microphone only, no built in speaker, so you can only talk but can not hear on the camera. With day vision, no night vision. ✔ NOTE: 1)Please make sure to connect your phone to Wi-Fi (Not support 5G wifi) when you are doing the One Key WiFi Configuration. 2) Please do the configuration in 5 minutes after the WiFi camera gets started. If exceed 5 minutes the configuration will be failed. You need to reboot the camera by power it up again. 3) Please wait for 2 minutes after you plug in the power cord since the camera needs to initialize. The UOKOO Wireless IP Camera is ideal suited to home usage. You can watch room, baby, toddler, pet, elder person at anytime and from anywhere. With the Home Surveillance System, you’ll never be out of the loop again. Simply download the iSmartViewPro app(Download from cd.ipcamdata.com) to your mobile device and you’re ready to go. Say bye-bye to traditional, complex setup processes that require you to have a degree in computer science. 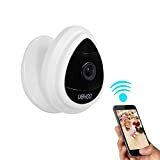 The UOKOO Security Camera with the Sonic Recognition can be quickly and easily set up by anyone using a mobile device on Wi-Fi (and/or Wired). Instantly see live video using your computer, tablet, or phone from anywhere. Simply scan, connect, and See What you want! (1) Download app “iSmartViewPro”, click “More” –“One Key WiFi” — Input WiFi name and WiFi Password”, and then click “configure”. (2) When the phone sounds “Beeps”, place the mobile near to the camera(less than 1 minute) until the camera LED blinks quickly, and then become always “On” status. This entry was posted in Discount Photography and tagged Alert, Camera, Detection/Email, Home, Mini, Motion, Security, Surveillance, System, UOKOO, White, WiFi by Ball Photo. Bookmark the permalink.